The pigeon orchid (Dendrobium crumenatum) may be the most common orchid in Western Indonesia (aka ‘anggrek merpati’). It grows wild in most towns and agricultural landscapes, and has deliciously scented white flowers which last only a day. However, the species is most notable for the simultaneous flowering of individuals in a population, as often as ten times a year. I’m spending a few days working in the hills of Bali, and nearly all the pinang palms (Areca catechu) in the terraced valley have a flowering clump of this orchid species on their extremely tall and narrow trunks. 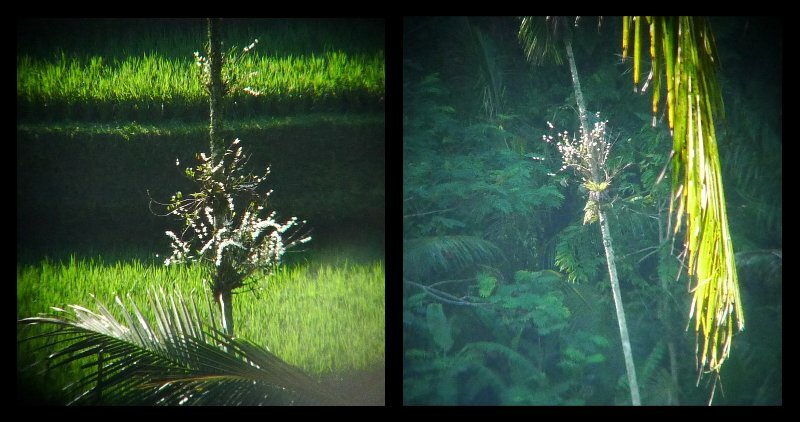 Interestingly, the orchids are not growing on the common coconut trees, despite the superficial similarity of their barks. Even though they are hundreds of meters away, and a fresh breeze is blowing, I can smell hints of their wonderful fragrance. I’ve seen this simultaneous flowering now in Bogor (Java), at home in Sukadana (West Kalimantan), and now here in Bali. This wonderful biological phenomenon must be observed constantly by biologists throughout the region, but there are no recent publications on it, and the causes are still only partially understood. Rutgers and Went (1916), after observing plants in Bogor and in the Netherlands, noted that simultaneous flowering events (“die coincidenz des blühens”) appeared to be related to moisture and temperature fluctuations in the preceding days. Then the indefatigable I. H. Burkill (see his massive 1935 work) added observations made in Singapore and suggested that it is a drop in temperature associated with a rain storm eight days before the flowering that acted as the proximal cue (Burkill 1917). This hypothesis was further confirmed by Seifriz (1923) based on further observation in the Bogor Botanic Gardens, although he noted the complicating and possibly refuting evidence of simultaneous flowering events only two days apart, both preceded by large rainfalls eight days previously. Coster (1926) appears to have confirmed experimentally the role of temperature (although I have been unable to get a copy of the original paper), and the Ecology of Indonesia team recorded temperature and flowering in Medan in 1983 (Whitten et al. 2000). These authors also speculated on the developmental basis of the ‘waiting’ stage: buds similar to those in temperate plants in the Spring that rest until triggered by an external stimulus. However the precise mechanism has not been reported (but see recent evo-devo work by Xu et al. 2006, Yap et al. 2008, Faridah et al. 2010). Additionally, the consequences of simultaneous flowering are unknown. Presumably the ultimate consequence is higher reproductive success, leading to selection for simultaneity---the commonness of this orchid may be a population-level result---but we do not know the effect of mass flowering on pollinators, or even what the pollinators are. So, here’s a call to students looking for projects. What a prefect study object! Common, beautiful, flowering frequently, with plenty of biological mysteries to solve. Burkill, I. H. (1935), A Dictionary of the Economic Products of the Malay Peninsula, Crown Agents for the Colonies, London. Faridah, Q.; Ng, B.; Raha, A.; Umi, K. & Khosravi, A. (2010), Differential expressions of putative genes in various floral organs of the Pigeon orchid (Dendrobium crumenatum) using GeneFishing, African Journal of Biotechnology 8(11), 2443-2453. Whitten, T. & Damanik, S. J., Anwar, J. & Hisyam, N. (2000) The Ecology of Sumatra. Tuttle Publishing, Yogyakarta. Xu, Y.; Teo, L.; Zhou, J.; Kumar, P. & Yu, H. (2006), Floral organ identity genes in the orchid Dendrobium crumenatum, The Plant Journal 46(1), 54--68. Yap, Y.; Loh, C. & Ong, B. (2008), Regulation of flower development in Dendrobium crumenatum by changes in carbohydrate contents, water status and cell wall metabolism, Scientia Horticulturae 119(1), 59--66.